The experimental technique of measuring energy changes accompanying any chemical or physical process is called calorimetry. Internal energy change is measured experimentally using an apparatus called Bomb calorimeter. It consists of a strong steel vessel which can stand high pressure. It is surrounded by a bigger vessel which contains water and is insulated. A thermometer and a stirrer are suspended in it. 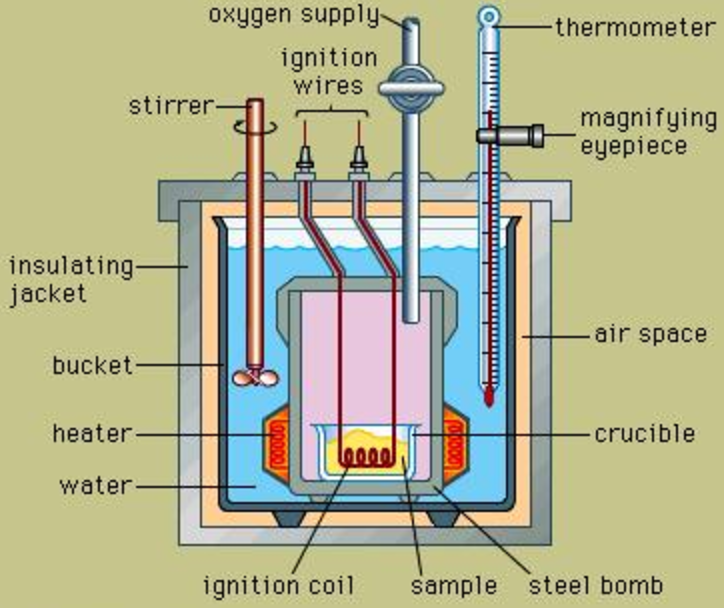 1)A known mass of compound is taken in the platinum cup.Oxygen under high pressure is introduced into the bomb. A current is passed through the filament immersed in the compound. Combustion of the compound takes place. The increase in the temperature of water is noted. From this, the heat capacity of the apparatus can be calculated. 2)The experiment is repeated as in step 1.As the reaction is carried out in a closed vessel, therefore, heat evolved is the heat of combustion at constant volume and hence is equal to internal energy change. Taking the example of heat of neutralisation of an acid with a base or vice versa, it can be determined using a simple calorimeter consisting of a polythene bottle fitted with a cork having two holes , one for the thermometer and the other for the stirrer. Instead of polythene bottle , a foamed polystyrene cup with a cover is also sometimes used .It is called coffee cup calorimeter. Taking the example of neutralisation of HCl with NaOH. 1) A known volume of HCL of known concentration ( 100cm3 of 0.5 N ) is taken in one beaker and an equal volume of NaOH of the same concentration (100cm3 of 0.5 N ) is taken in another beaker. 2)Both the beakers are kept in water bath till the solution attain the same temperature. 3)HCl solution kept in the first beaker is transferred into the polythene bottle.Immediately NaOH solution kept in the second beaker is added into the polythene bottle.Stirring is done to mix HCl and NaOH.The highest temperature attained is noted. This give the heat of neutralisation per equivalent. Heat of neutralisation of a strong acid by a strong base is always equal to 57.1 kJ equi-1 or 57.1 kJ mol-1 of H+ or OH– ions. For any reaction occurring in solution, the heat change accompanying the reaction at constant pressure i.e. enthalpy change can be measured by using the calorimeter. The reaction is allowed to take place in the polythene bottle. If the reaction is exothermic, temperature will rise and if the reaction is endothermic, temperature will fall. For exothermic reaction, ΔH is negative whereas for endothermic reaction, ΔH is positive. For the measurement of qp or ΔH ,the reaction may be carried out in a vessel with conducting walls. This vessel may be placed in an insulated outer vessel containing water and fitted with a stirrer and a thermometer. The Rise or fall in temperature may be recorded and the result calculated.